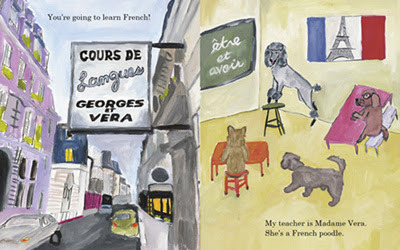 Picture books about dogs are a dime a dozen, but picture books about dogs in Paris--ooh, la, la, that's a smaller group. I remember on my first trip to Paris, many many years ago, being flabbergasted that dogs were everywhere--including in restaurants, where they were treated with great respect. 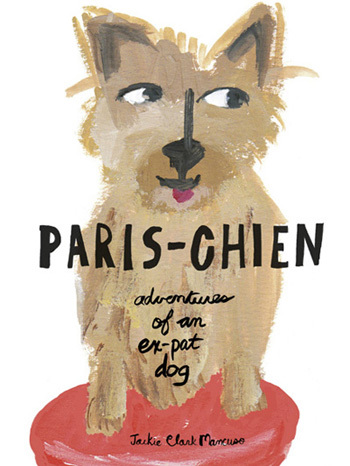 But what would it be like to be an American dog in Paris? In Paris-Chien (a pun on the French word parisien--OK, it took me a few minutes to get that one, and you have to pronounce Paris in French--par-ee--for it to work! ), we meet Hudson, an adorable Norwich terrier who has recently moved to Paris with his American owner. However, adjusting to a new culture is apparently as difficult for dogs as for people--Hudson didn't realize that French dogs spoke French rather than "dog"! But no worries, his owner enrolls him in French language classes, taught by Madame Vera--a French poodle. Soon Hudson is as happy as a clam--or maybe a baguette or croissant--in his new home, and even has a French girlfriend! This is a delightful book that is sure to please dog lovers and Francophiles alike. The book is peppered with French phrases, which are translated in a "petit dictionnaire" in the back (although there is no phonetic translation, so the author seems to assume that the readers will already know a little French). Children and adults alike will enjoy the "fish out of water" story of Hudson adjusting to Paris, told with a gentle sense of humor. The gouache artwork is particularly charming, and the color palette and flat, stylized technique evoke 20th century French artists such as Matisse. Author Jackie Clark Mancuso was inspired to write this book by her own experiences as an ex-pat in Paris. Hudson is a real dog, and you can learn more about him on his Facebook page. Sounds like a fun little story - we just introduced a stuffed animal, a poodle, into our school library and had fun choosing a name, choices were Lulu, Suzette and Gigi. (Lulu won!) 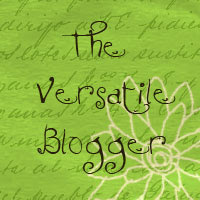 I'll put this one on my list - thanks for the review! Looks charming. Same illustrator as Julia Child picture book? Thanks for the heads up on the title. Once you explained it, I got it.